Two Charles Darwin University researchers from The Northern Institute have received international recognition for their contributions to research and teaching in tourism and health management. The University of Applied Sciences (IMC) in Krems, Austria, is a long-standing partner of CDU with research and teaching exchanges continuing to bolster CDU’s research in tourism and health management. 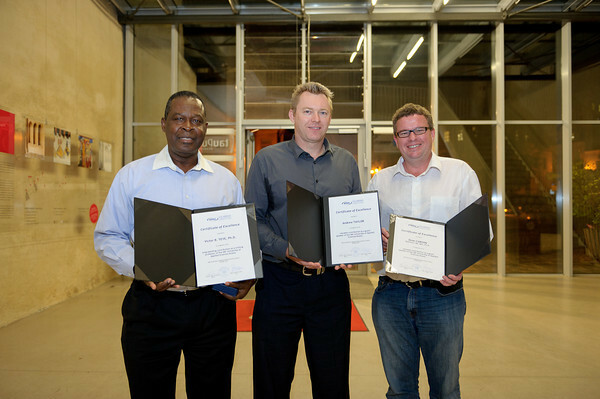 IMC Krems has recognised the teaching contributions of Principal Research Fellow Professor Dean Carson and Senior Research Fellow Mr Andrew Taylor with a dinner and presentation ceremony. In October Professor Carson and Mr Taylor, along with former CDU researcher Dr Doris Schmallegger, were engaged by IMC Krems to teach a range of second semester topics to tourism students at the Bachelor and Masters levels. “This teaching block was a good opportunity to strengthen the CDU and IMC Krems relationship, which has provided many fine research interns to bolster tourism and health management research at CDU,” Mr Taylor said. He said students were interested in comparing and contrasting contemporary tourism issues between rural Australia and rural Austria. “The three-week block of teaching included theoretical and practical aspects of cultural, aspirational and backpacker tourism, as well as in-depth examinations of contemporary approaches to destination marketing for rural and remote destinations,” he said. The dinner and awards were hosted by Rector Professor Mag Eva Werner and Head of International Programs Professor Dr Maximilian Schachner.